Navajeevan Cooperatives Ltd. (NCL) Dhangadhi, has been awarded as a best cooperative society in Sudurpashchim State. 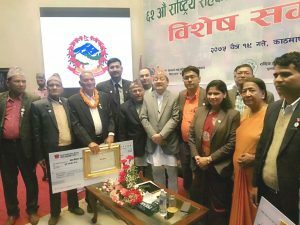 On the occasion of 62th National Cooperative Day’s Special Program organized by Department of Cooperatives, Hon’ble Prime Minister Mr. K. P. Sharma Oli handed over the Certificate of Honour and a cheque of Rs. 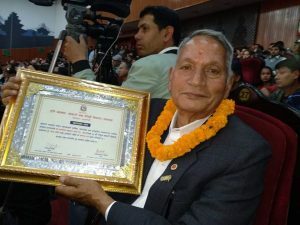 200,000 to Mr. Chakra Bahadur Singh, President of NCL. 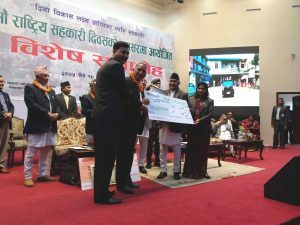 The program was held at Rastriya Sabha Griha, Kathmandu and Land Reform, Cooperatives and Poverty Alleviation Minster Mrs. Padma Aryal other distinguished persons delivered their valuable speech.